How to play the latest incarnation of Quest Mage on the Standard ladder this month. 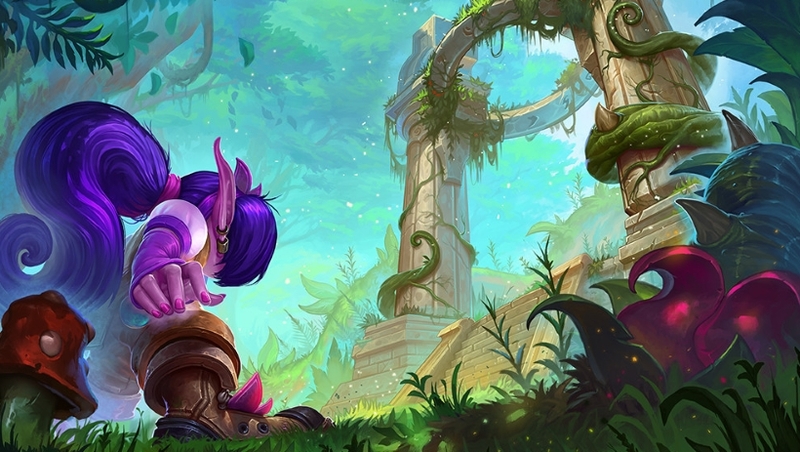 Our Quest Mage deck list guide features the best Rastakhan deck list for Hearthstone (January 2019). Our Quest Mage guide will also be updated with Mulligan advice, card combos and strategy tips. Quest Mage is a Hearthstone deck with a win condition that's simple to understand but considerably trickier to pull off before you run out of time. In simple terms, you hope to complete the Open the Waygate quest and field a pair of Sorcerer's Apprentices which can be duplicated with Molten Reflections. From here it's a case of hitting Time Warp and then playing Archmage Antonidas and an endless stream of Fireballs into the opponent's face. Historically it's been something of a gimmicky deck, but the release of Knights of the Frozen Throne made it feel at least a little bit more consistent on the Hearthstone ladder. Its fortunes in the Rastakhan meta is uncertain to say the least, but we've put together a guide that's packed full of tips to help you get started. First of all we've got a solid deck list for you to pilot, followed up with a bit of advice on Mulliganing the deck correctly. After that we've outlined the strategy involved with playing this archetype, then wrapped up with the the usual breakdown of combos and card synergies. This section above all others will help you get started, but only experience will teach you the rest! Let us know if you find success with this deck in the comments - good luck! While it's some way away from being a truly competitive deck, Quest Mage is nevertheless seeing some play in the Rastakhan new year meta. We've fully incorporated a new deck list into this guide, and updated all sections of our strategy advice. As we've already mentioned in the introduction, the name of the game here is to stall the match out for as long as possible until you've able to drop your big combo: 2 x Sorcerer's Apprentices copied by 2 x Molten Reflections, followed by an infinite stream of Fireballs generated by Archmage Antonidas. If you've been checking the maths as we go, you'll realise that it's not possible to field that many minions in one turn and that's where Open the Waygate comes in. Completing this Quest rewards you with Time Warp, which provides you with the necessary Mana reserves to get the job done. Just as with any control / OTK deck, the challenge really is to simply stay alive until you reach your huge late-game play, or have gained enough direct damage spells that the full combo isn't even necessary. If you survive into the mid-game then you should be in strong shape to go the distance, but it is not going to be easy to get there and in an aggro-heavy meta you're probably going to struggle to climb consistently. In these kind of matches you have a lot more time to idly cycle through your draw cards and start bringing together the pieces of your win-condition. Look for big removal in your Primordial Glyphs to buy you extra time, but keep in mind that it is possible to grab too many cards in a slow match-up - it's horrifying when you burn a crucial part of your combo, but it will happen while you learn this very fiddly deck! 1. Open the Waygate - This always shows up in your opening hand, and you want to keep it and play it on Turn 1. 2. Loot Hoarder - Something to contest the board with and then gain an extra piece of your puzzle when it's sacrificed. 3. Novice Engineer - More useful for its card-draw Battlecry effect than anything else. 4. Acolyte of Pain - The theme of your Mulligan is all about gaining more cards - don't forget that you can ping the Acolyte with your own hero power too. 5. Primordial Glyph - One of the course sources of spells that did not originate in your deck. 6. Arcane Intellect - A much lower-priority keep as you'd rather play anything else earlier on. Not a disaster if you get it by any means, however. - Each Sorcerer's Apprentice on the board reduces the cost of your spells by one Mana. - Your show-stopping combo involves your Sorcerers Apprentices getting the Molten Reflection treatment. You can then use Time Warp to play Archmage Antonidas, followed by an endless feast of Fireballs. - As long as Bloodmage Thalnos is out on the board the strength of your damage spells is increased by one. You'll also draw a bonus card when this minion dies. - Any time that Acolyte of Pain takes even the slightest amount of damage you'll draw an extra card. You can ping this minion with your hero power as well. - Any spell you play while Archmage Antonidas is out in play will cause a Fireball to be added to your hand. Keep churning them into the opponent's Health pool! - The following cards can all be used to generate spells that qualify for the quest completion: Tome of Intellect, Primordial Glyph and Banana Buffoon. @Jordanzobean123 It's gone back and forth a few different ways since then, but yeah it's crazy how similar it is. Mind you, look at Freeze Mage - that didn't change for about three years or more.